The second expansion for Star Wars: The Old Republic has a name and a date. 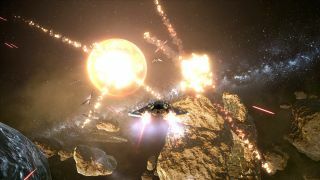 Galactic Starfighter, a free expansion will introduce rail-free space combat to the game for the first time, in the form of 12v12 PvP dogfights. How soon you'll be able to join in depends on your Subscriber/Preferred status in the game. Subscribers to SWTOR will gain access to the expansion on December 3, followed by Preferred (anyone who has ever been a subscriber or made a purchase in the cash shop) players on January 14, and the scruffy-looking nerf herders that haven't spent money on the game will get it February 4. Everyone will get access at no charge, but non-subscribers will be required to buy a Starfighter Pass from the cartel market to have the same progression opportunities as subscribers. Player starships will come in multiple classes with multiple roles. The three we know about so far are the light, fast Scout, the offense-heavy Gunship, and the Strike Fighter, which seems to be somewhere in between. You can see previews of each for both Republic and Empire on the expansion's announcement page .